John Day Fossil Beds National Monument (click to article or see photo show below): March 15-16 was an excellent time for us to visit, with pleasant temperatures; snow-free most of the year. Wenaha River Trail (8.2 miles/600 ft gain): on May 19, this pleasant trail was dry and snow-free. We enjoyed being the sole campers next to the Grande Ronde River in quiet Shilo Troy RV Resort (hot showers; electric hookup). Imnaha River Trail (9.3 miles/800 ft gain), Hells Canyon National Recreation Area, Wallowa-Whitman National Forest: May 20 was perhaps a week too late to avoid an overgrowth of poison ivy and blackberry thorns across the trail – next time, early to mid-May should be best. Bring a machete. For sure, avoid midsummer heat on this trail which is hikeable from late March through November. In Enterprise, Log House RV Park had friendly staff and good views of the Wallowa Mountains and Eagle Cap Wilderness. Ninemile Ridge Trail (5.3 miles/1250 ft gain, plus more if you want): May 21 had excellent Lupinus luteolus (Pale Yellow or Butter Lupine) flowers; usually best from mid- to late-May. Iron Creek to Teanaway Ridge Trail (7.2 miles/1850 ft): May 28 had excellent footing, with some easily crossed snow patches at the top. Camp in nice quiet Forest Service pullouts along the gravel access road. Ingalls Creek Trail (11.2 miles): Excellent on May 29; best mid-May to early-June for wildflowers and rushing high-volume water; hikeable May to October. Camp conveniently in Blu-Shastin RV Park near Leavenworth. Table Mountain Trail #1209, near Blewett Pass, Wenatchee National Forest (5 miles/800 ft): on May 30, one snow blockage in the access road forced us to walk a mile to the trailhead, discovering beautiful rafts of Glacier Lilies, Grasswidow, and Columbian lewisia flowers under the burnt forest! Mt Si Trail, North Bend (9 miles/3170 ft): snow-free most of the year, except summit Haystack area. West Tiger Mountain, Issaquah: snow-free most of the year. Cougar Mountain, Issaquah: snow-free most of the year. Wallace Lake, Gold Bar (loop 8.5 miles/1500 ft): snow-free most of the year. Copper Butte Trail (9.2 mi/2150 ft, reaching 7140 feet elevation): snow-free footing on June 12. Wapaloosie Mountain Trail (6.2 mi/1850 ft, reaching 7018 feet elevation): snow-free footing on June 13. Photos of Columbia River Gorge National Scenic Area span both Oregon and Washington, including: Multnomah Falls, Latourell Falls, Wahclella Falls, moss smothered trees on Tanner Creek, Horsetail Falls & Creek, Upper Horsetail (Ponytail) Falls, Beacon Rock, Triple Falls & Middle Falls of Oneonta Gorge, Wahkeena Creek, Fairy Falls, blossoms of Red-flowering currant (Ribes sanguineum), tugboat pushing barges of grain. Search for latest travel books on Amazon.com: Washington travel books; Oregon travel books. The Olympic Peninsula in the state of Washington is captured in photo galleries below featuring sea coast, haystacks, animals, mountains, flowers, and plants. In 1981, Olympic National Park was honored as a World Heritage Site by UNESCO. Animal photos from the Olympic Peninsula of Washington include: Roosevelt elk, a deer with Mount Olympus in background, and a clay chicken on a lavender farm. The Roosevelt elk (or Olympic elk, Cervus canadensis roosevelti) is the largest of the four surviving subspecies of elk in North America. Photos of mountains on the Olympic Peninsula include: Mount Olympus with deer, Olympic National Park, Big Quilcene Trail to Marmot Pass, ferry with mountain backtrop, and an aerial view of Hood Canal and Olympic Range. Coast, ferry, and town photos from the Olympic Peninsula, Washington include: dramatic thunderhead and big logs on Kalaloch Beach, sea stacks on Ruby Beach, Olympic National Park, Cape Flattery sea caves on the most northwestern point of the contiguous United States, Port Townsend Historic District, Kingston Ferry, sunset light on abstract cloud pattern, aerial view of Hood Canal and Olympic Mountains. The following photos from the Olympic Peninsula include: lavender farms, rusting equipment, sunflowers, rhododendron wildflowers on Mount Townsend hike, Phlox flowers, profuse Columbine flowers (genus Aquilegia in Buttercup family, Ranunculaceae), Olympic larkspur (Delphinium glareosum Greene), orange-red Indian paintbrush (Castilleja), False Solomon’s Seal (or Treacleberry, Latin name Maianthemum racemosum), water streaming by Devils Club (Oplopanax horridus, Araliaceae), rime frost on grass and trees, rays of light through moss covered trees in Hoh Rain Forest, ferns. Search for latest Washington travel books on Amazon.com. Washington map of major parks, cities, roads, geography. Photos from hikes and sights in the North Cascades mountain range in the state of Washington (USA) include the following galleries: Mount Baker Highway 542, North Cascades Highway 20, Cascade River Road, Baker Lake Road, and Skagit River Delta. The volcanic cone of Mount Baker rises to 10,781 feet elevation. In late afternoon, don’t miss seeing Mount Shuksan reflected in Picture Lake or Highwood Lake, where Highway 542 splits into a one way loop around the lakes in Heather Meadows Recreation Area. For a special treat, hike at peak autumn color season in early October. Picture Lake (located in Heather Meadows, Mount Baker – Snoqualmie National Forest) reflects Mount Shuksan (9127 feet elevation in North Cascades National Park). One of the most rewarding hikes in Washington is the Galena Chain Lakes Loop Trail in Heather Meadows, best from late July through early October. See stunning views of Mount Shuksan, Mount Baker and pretty lakes at almost every turn. To start a shorter version of this hike, drive from Bellingham to the end of the Mount Baker Highway 542. At Artist Point parking lot, start a 6 mile out and back walk to Chain Lakes (or 3 miles round trip to the Ptarmigan Ridge turnoff, or 2.5 miles round trip to the top of Table Mountain). Even better, hike the 9 mile Chain Lakes Loop Trail counterclockwise starting from Austin Pass Visitors Center or the Ski Area parking lot at Bagley Lakes in Heather Meadows Recreation Area, visiting Bagley Lakes, Herman Saddle, Chain Lakes (Iceberg Lake, Hayes Lake, Mazama Lake), Artist Point, and Austin Pass Visitors Center. Church Mountain trail is a hike of 8.5 miles round trip with 3800 feet elevation gain in Mount Baker – Snoqualmie National Forest. Trailhead is 5 miles east of Glacier Public Service Center. Excelsior Pass is the next hike east (off of Highway 542) in Mount Baker Wilderness. Further east, hike scenic Hannegan Peak 10 miles round trip with 3100 feet elevation gain. Sauk Mountain is an easy day hike of 4 miles round trip and 1100 feet vertical gain, near the town of Concrete. Camp with your vehicle in the impressive scenery of Ross Lake National Recreation Area. From Rainy Pass, hike Maple Pass Loop (7 miles with 2000 feet gain) or Cutthroat Pass (9-12 miles round trip with 1800-2300 feet gain). Near Washington Pass, hike easy Blue Lake Trail, especially beautiful in early October when larch needles turn golden. Near Mazama, hike Harts Pass and Grasshopper Pass on the Pacific Crest National Scenic Trail in Okanogan National Forest for more golden larch color in early October. Hike Hidden Lake Lookout (8 miles round trip with 3500 feet elevation gain). Hike Cascade Pass (7 miles round trip with 1800 feet gain) or further up to Sahale Arm (11 miles round trip with 3000 feet gain), a favorite for views of stunning U-shaped glaciated valleys and soaring ice clad peaks. Backpack onwards into wild Stehekin River Valley which connects to Lake Chelan and the Lady of the Lake passenger ferry. Below are photos from hikes and sights along Baker Lake Road in the North Cascades mountain range, Mount Baker National Recreation Area, Washington. The Railroad Grade Trail follows a lateral moraine of the Easton Glacier which flows from the south side of Mount Baker (10,781 feet). Photos from the Skagit River Delta include large flocks of snow geese on farmers’ fields, and expanses of commercial tulips and daffodils (Narcissus) blooming in mid April. Search for latest “Washington North Cascades” books on Amazon.com. Trails Illustrated Mount Baker & Boulder River Wilderness Area: Topo Map. Coverage includes: Mount Baker National Recreation Area, Skagit Wild & Scenic River, Mount Baker, Mountain Loop & North Cascades Scenic Byways Wilderness, Noisy Diobsud Wilderness Area. 1:75,000. View Tom Dempsey’s photographs of Washington islands, including Bainbridge, San Juans, Whidbey and Fidalgo Islands. Make a delightful Northwest trip and view Tom’s prints plus work of various artists at Gallery@Roads End, 2843 Aiston Creek Road, Lummi Island, Washington 98262. The Bloedel Reserve is a 150-acre forest garden on Bainbridge Island, Washington, made by the vice-chairman of a lumber company. The Bloedel Reserve has both natural and highly-landscaped lakes, immaculate lawns, woods, a traditional Japanese garden, a rock and sand Zen garden, a moss garden, a rhododendron glade, and a Reflection Garden. The Bloedel’s French Chateau-style home is preserved as a Visitor Center, including many original furnishings. Reservations may be required. The following photos portray Bloedel Reserve near peak fall foliage colors on October 19, 2005. The San Juan Islands can be reached via the Washington State Ferry Terminal in Anacortes on Fidalgo Island, Washington, USA, or from Sydney (near Victoria) on Vancouver Island in British Columbia, Canada. Ferries dock at Friday Harbor after visiting Orcas Island and other islands in San Juan County. From the ferry, admire the volcanic cone of Mount Baker rising to 10,775 feet elevation near Twin Sisters Mountain on the mainland. On San Juan Island, in Lime Kiln Point State Park, watch for orcas (killer whales) which cruise right off the shore near the 1919 Lime Kiln Lighthouse. Visit American Camp and English Camp to learn of the historic Pig War 1859-1872, which peacefully arbitrated the San Juan Islands into the territorial United States. The San Juan Islands archipelago is in the Salish Sea, north of the Strait of Juan de Fuca, west of Rosario Strait, east of Haro Strait, and south of Boundary Pass and the Strait of Georgia. Whidbey Island, the largest island in Washington, offers many good photo opportunities. Visit popular Deception Pass State Park, where State Route 20 crosses a 180-foot high bridge over swirling saltwater currents of the Salish Sea. Tugboats shepherd huge log rafts through Deception Pass. Watch bird life such as Great Blue Heron and Bald Eagle. Admire lichen covered old growth trees on quiet walks. Indian Camas (or Indian hyacinth or Wild hyacinth, Camassia quamash) and other wildflowers bloom in spring and summer. Visit Ebey’s Landing National Historical Reserve, including: Admiralty Head Lighthouse (built 1890) in Fort Casey State Park and Crockett Blockhouse. In Meerkerk Gardens, admire a colorful concentration of hybrid rhododendron flowers blooming in late April. Drive to Fidalgo Island on the north side of Deception Pass Bridge. At Anacortes, see oil refineries, oil tankers, boats, docks, and catch a ferry to the San Juan Islands. On a clear day, see the volcanic cone of Mount Baker rising in the North Cascades 40 miles to the east. Lummi Island is west of Bellingham in the Salish Sea, in Whatcom County, Washington, USA. Make a delightful Northwest trip and view Tom’s prints plus work of various artists at Gallery@Roads End, 2843 Aiston Creek Road, Lummi Island, Washington 98262. Vendovi Island lies across Samish Bay from mainland Skagit County, between Guemes Island and Lummi Island in the Salish Sea, Washington. The former Fluke family vacation home greets public visitors in a small bay on the northwest side of Vendovi Island. Register for day use and walk the nature trails to beaches and bluff views. The San Juan Preservation Trust, a land trust that conserves open space in the San Juan Islands, purchased the island in December 2010 from the family of John Fluke Sr. Vendovi Island was named after a Fijian High Chief Ro Veidovi who was brought to North America by the 1841 Wilkes Expedition. To keep the island open to public access, support the “Campaign to Save Vendovi Island” at sjpt.org. Search for latest “Washington San Juan Islands travel” books on Amazon.com. Ascend excellent trails to impressive peaks, flowers, lakes, and streams in the Central Cascades along the Mountain Loop Highway, in Mount Baker-Snoqualmie National Forest, from Granite Falls to Verlot Public Service Center to Darrington, in Washington, USA. Hike well marked trails to beautiful mountains in the Central Cascades along the Mountain Loop Highway. The following photos include: Three Fingers, Goat Flats, Green Mountain, Downey Creek, Dome Peak, Bald Mountain, Walt Bailey Trail, Mount Pilchuck Natural Resources Conservation Area (NRCA), Mount Pilchuck State Park, Gothic Basin, Sheep Gap Mountain, Silvertip Peak, Monte Cristo, Glacier Peak, Mount Dickerman, Del Campo, Morning Star, Sperry, and Vesper Peaks, Hall Peak, Big Four Mountain, Sloan Peak, Mount Pugh, South Fork Stillaguamish River Valley, , Foggy Peak above Goat Lake, and distant Mount Baker, Mount Shuksan, and Mount Rainier. Hiking from trailheads along the Mountain Loop Highway reveals a variety of native wildflowers, plants, and insects to photograph, such as: Columbine (genus Aquilegia), fireweed, Cornus canadensis (Canadian Dwarf Cornel, or Canadian Bunchberry, or bunchberry dogwood), Five-Finger Fern (or Western Maidenhair, or Adiatnum pedatum aleuticum), False Lily-of-the-Valley (Maianthemum), vine maple leaves silhouetted, heavy moss on trees, water drops on skunk cabbage (Lysichitum americanum), fall foliage colors, hoverfly on daisies, and Swallowtail butterfly. Hike wonderful trails to distinctive water, lake, and snow features along the Mountain Loop Highway, in Mount Baker-Snoqualmie National Forest. The following photos are from Goat Lake in Henry M. Jackson Wilderness, Cutthroat Lakes on the Walt Bailey Trail, and Foggy Lake in Gothic Basin. Snowshoe or hike to Lake Twenty-Two Research Natural Area, and to adjacent Heather Lake in Mount Pilchuck State Park. Search for latest “Washington Mountain Loop Highway” books on Amazon.com. The Central Cascades of Washington are easily reached for spring, summer, and fall hikes and winter snow sports via Interstate 90 and Stevens Pass Highway US 2. Hike, snowshoe, or ski to see diverse ecosystems, mountain vistas, lakes, streams, flowers, ferns, and mushrooms in Alpine Lakes Wilderness Area, Wenatchee National Forest, and Mount Baker-Snoqualmie National Forest. Mountain photos from hikes near Stevens Pass Highway (US 2) include: Baring Mountain, Carne Mountain (with views of Glacier Peak, Buck Mountain, Liberty Cap, Fortress Mountain, Chiwawa Mountain and Spider Gap), and yellow larch needles in October in the Enchantments (trailhead off Icicle Creek Road, Leavenworth). Photos from hikes near I90 include: Mason Lake/Ira Spring Trail to Mount Defiance, Granite Mountain (with views of Mount Rainier), Snoqualmie Pass, Snow Lake, Polallie Ridge, and Ingalls Pass (to view Mount Stuart, the second highest non-volcanic peak in the state). Photos from snowshoeing near Stevens Pass Highway (US 2) include: Leavenworth Bavarian Ice Fest and Icicle Creek Road. Photos from snowshoeing near I90 include: Snoqualmie Pass, Kendall Peak Lake, Snow Lake, Commonwealth Basin, and Ingalls Pass (to view Mount Stuart, the second highest non-volcanic peak in the state). Abundant rainfall in the Central Cascades of Washington creates many unique water features accessible from hikes in Alpine Lakes Wilderness Area, Wenatchee National Forest, and Mount Baker-Snoqualmie National Forest, accessed near Interstate 90 and US Highway 2. Water photos from hikes near Stevens Pass Highway (US 2) include: Skykomish and Lake Serene. Photos from hikes near I90 include: Mason Lake/Ira Spring Memorial Trail to Mount Defiance, Twin Falls, South Fork Snoqualmie River, Twin Falls Natural Area, Ollalie State Park, Rachel Lake, Rampart Lakes, and Box Canyon. Tiger Lily or Columbia lily (Lilium columbianum), Glacier Lily, Columbine flower, Bunchberry Dogwood flowers (cornus canadensis), Monkeyflower (Mimulus), Columbia Monkshood (Aconitum), Bear Grass (tenax, genus: Xerophyllum, family: Liliaceae), pink thistle with camouflaged Crab Spider (Family Thomisidae), Woolly Chanterelle mushrooms (Gomphus Floccosus), False Chanterelle (Clitocybe aurantiaca), Admirable Boletus mirabilis, Coral Hydnum mushroom (Hericium coralloides), white oyster mushrooms, Pinesap (monotropa hypopithys L.), bracket fungi (shelf fungi), Pine-drops (Pterospora), Western Coral-Root (Corallorhiza mertensiana), Five-Finger Fern (or Western Maidenhair, Latin name Adiatnum pedatum aleuticum), White Veratrum (Veratrum Californicum) leaves, vine maple, larch (yellow needles in fall, genus Larix), Salal (Gaultheria shallon) with water drops. Search for latest “Washington Alpine Lakes Wilderness” books on Amazon.com. The state of Washington is one of the most ecologically and scenically diverse in the USA. In altitude, the land varies from sea level to 14,411 feet at the summit of Mount Rainier, an awesome active volcano covered in glaciers. The Carbon Glacier flows to a lower altitude than any other glacier in the Lower 48 states. A huge glacier actually covered Seattle 3,000 feet deep in ice only 15,000 years ago, gouging the scenic fjord of present-day Puget Sound. The state lies in a transitional latitude between sub-Arctic northern forests and warmer drier regions. Moist temperate air masses sweep onto the west coast and hit the spectacular Olympic and Cascade mountain ranges, dumping heavy rain on the southwestward (windward) slopes, creating dense temperate rainforest. The mountains wring the air dry, creating extensive rain shadows to their east and northeast, such as in the sunny San Juan Islands, and in the desert lands of Eastern Washington, irrigated by the mighty Columbia River. 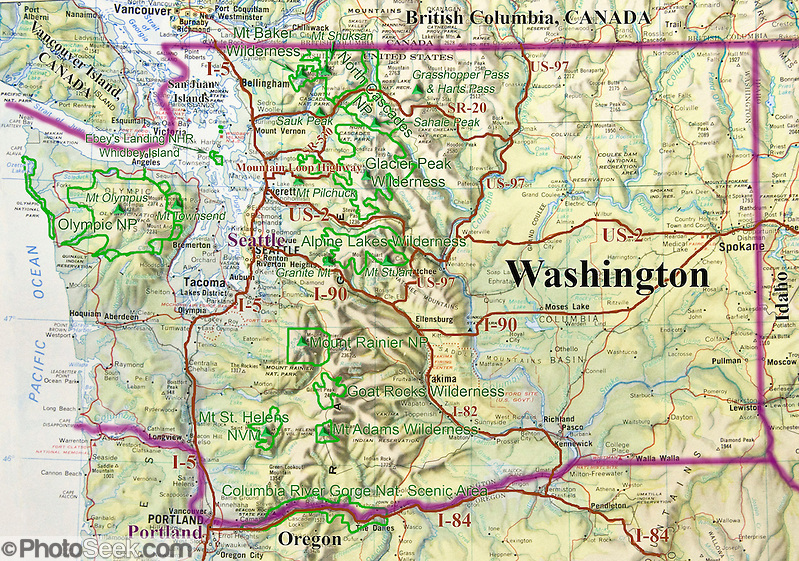 Washington boasts a tremendous variety of landscapes, native plants, and wildflowers. See the wonders! Search for the latest Seattle and state of Washington travel books on Amazon.com. Mount Saint Helens is an active stratovolcano in Skamania County, Washington, and is one of 160 active volcanoes that comprise the Pacific Ring of Fire. The May 18, 1980 eruption was the most deadly and economically destructive volcanic event in the history of the United States. Fifty-seven people were killed. 250 homes, 47 bridges, 15 miles of railways and 185 miles of highway were destroyed. A massive debris avalanche during the eruption reduced the elevation of the mountain’s summit from 9677 feet (2950 m) to 8364 feet (2550 m), leaving a mile-wide horseshoe-shaped crater. The debris avalanche, of up to 0.7 cubic miles (2.3 km³) in volume, was the largest in recorded history. As the crow flies, Mount St. Helens is 96 miles (154 km) south of the city of Seattle and 53 miles (85 km) northeast of Portland. The mountain, part of the Cascade Range, takes its English name from the British diplomat Lord St Helens, who was a friend of George Vancouver, an explorer who made a survey of the area in the late 18th century. Search for latest “Washington travel Mount Saint Helens” books on Amazon.com. A very scenic hike visits Snowgrass Flat and Goat Ridge over a 13 mile loop with 3180 feet total gain in Goat Rocks Wilderness, Gifford Pinchot National Forest, Washington, USA. Ice still covers most of Goat Lake in late July, but the trail should be mostly free of snow barriers by then. Hike Goat Rocks on a clear day to admire several nearby Cascades volcanoes: Mount Adams, Mount Saint Helens, and Mount Rainier. Watch for lenticular (lens shaped) clouds hovering in standing waves of wind sweeping over the volcanic cones. The following wildflowers bloomed abundantly on July 28, 2006 (see photos): subalpine mariposa lily (Calochortus subalpina, or mountain mariposa lily), pink heather, lupine flowers, Bear Grass (Latin name tenax, also commonly called Indian Basket Grass, Soap Grass, or Squaw Grass), Indian paintbrush (Castilleja), and Western Anemone flowers with hair-like seed heads. The Goat Rocks Wilderness is a unique area characterized by high alpine terrain centered around an ancient volcano which dominated the area some two million years ago. The mountainous terrain is between 3,000 and 8,184 feet elevation, much above timberline. Elk, mountain goats, marmots, deer, and a variety of birds reside here. Search for latest “Washington travel Goat Rocks” books on Amazon.com. Trails Illustrated Goat Rocks, Norse Peak & William O. Douglas Wilderness Area (National Geographic) topographic hiking map with easy to read trails, numbered forest service roads, campsites, access points, scenic points-of-interests, important facilities. Scenic trails in and around Mount Rainier National Park are revealed in the following photo galleries. Several spectacular hikes start at Paradise Visitor Center in Mount Rainier National Park, Washington, USA. Walk the stunning Skyline Loop Trail any good summer day, or view spectacular fall foliage colors peaking in the first or second week of October. A good loop or car shuttle hike starts at Paradise along the Skyline Trail to Lakes Trail, along Mazama Ridge, and downhill to Reflection Lakes where you meet the Stevens Canyon Road. Optionally loop back high or low. Spray Park and Tolmie Peak are some of the best hikes in Washington for enjoying fields of blooming Avalanche lily flowers (Erythronium) in mid July. Look for lenticular cloud caps (see photos) which occasionally condense from water vapor in standing waves of wind flowing over Mount Rainier. Such lens-shaped clouds over Mount Rainier probably led to invention of the term UFO (Unidentified Flying Object). The first widely publicized UFO sighting in the United States came from private pilot Kenneth Arnold flying over Mount Rainier in June 1947. Arnold’s report of nine flying shapes like pie pans and half moons soon led press to popularize the term “flying saucer.” Then, in 1952, the term “UFO” was first suggested by Captain Edward J. Ruppelt who headed the US Air Force’s Project Blue Book, the official investigation of UFOs. Hike several classic trails from Sunrise Visitor Center in Mount Rainier National Park. Walk the aptly named Wonderland Trail towards the vast flower fields of Berkeley Park. Or wander past Shadow Lake and Sunrise Camp to stunning glacier views from Burroughs Mountain. Or for vigorous physical conditioning at moderately high altitude, hike the Burroughs Mountain Trail from White River Campground in a 10 mile loop, reaching a high point on Second Burroughs Mountain, 7400 feet elevation above sea level. The trail ascends and descends 3200 feet total, starting from White River Campground, continuing up Glacier Basin Trail and returning via Shadow Lake. View fields of yellow glacier lilies in mid-July and other flowers later, until snows returning in late October discourage safe hiking. Beware a few steep snow banks remaining in July and new slippery snow after mid October. Hike from White River Campground to the flower fields of Summerland and further to scenic Panhandle Gap, the highest point on the Wonderland Trail of Mount Rainier National Park. Summer wildflowers include gentian, lupine, and Lewis’s Monkeyflower. Mount Rainier looms large to the west and Mount Adams appears on the southern horizon. Hike Naches Peak loop trail in the first half of October for good fall foliage color in Mount Rainier National Park. Park your car at Tipsoo Lakes on Highway 410 just west of Chinook Pass, between Enumclaw and Yakima. Easily walk the Naches Peak Loop Trail from the Tipsoo Lakes picnic area to Chinook Pass, cross the highway, and continue clockwise for best Mount Rainier views to the west. View Mount Adams in the distance to the south. From 1913 to 1994, Mount Rainier’s glaciers shrank 22% by area and 25% by volume in conjunction with rising temperatures (Nylen 2004). Monitored glaciers are continuing to retreat as of 2009 (NPS). Over the last century, most glaciers have been shrinking across western North America (Moore et al. 2009) and the globe (Lemke et al. 2007), in association with increasing temperatures. Mount Rainier’s glaciers make up a quarter of the total ice area in the Lower 48 states. Read more about global warming and climate change. Search for latest “Washington travel Rainier” books on Amazon.com. Visit diverse neighborhoods of Seattle, Washington in the following colorful photo galleries. The following photos of downtown Seattle include: sunset reflection on building skyline and Space Needle seen from Kerry Park, fireworks, Pike Street Public Market fish-throwing tradition, Seattle Public Library architecture, Seattle Center monorail. Seattle Art Museum’s Olympic Sculpture Park opened in 2007 at the southern end of Myrtle Edwards Park (near both Seattle Center and the waterfront/Elliot Bay/Puget Sound). Free entry to the public. Address: 2901 Western Avenue, Seattle, Washington 98121. Admire handsome architecture and attractive landscaping on a walk through the University of Washington in Seattle. The following photos include: Hutchinson Hall, Meany Hall auditorium, Meany Studio Theater, Chihuly art, Jones Playhouse, Japanese Garden in Washington Park Arboretum. Seattle Art Museum’s Olympic Sculpture Park, opened in 2007 at the southern end of Myrtle Edwards Park (near both Seattle Center and the waterfront/Elliot Bay/Puget Sound). Free entry to the public. Address: 2901 Western Avenue, Seattle, Washington 98121. The following photos from the excellent Woodland Park Zoo include: jaguar, pink flamingos, Red Panda, hippopotamus, bald eagle, grizzly bear, Komodo dragon, Eastern Rosella, Bourke’s Parrot, budgerigar, Crocodile, Northern Pacific Rattlesnake, butterflies, tapir, Spangled Cotinga, plains zebra, female lion, African Wild Dog. Volunteer Park Conservatory(telephone 206-684-4743) is located at 1400 E. Galer Street, Seattle, WA. The City of Seattle first acquired this land at the highest point (444 feet elevation) of Capitol Hill neighborhood in 1878 from a sawmill engineer. The Olmsted brothers, famous landscape architects, helped redesign the park. In 1901 City Park was renamed Volunteer Park to honor the volunteers who served in the Spanish-American War (1898-1902). The Conservatory was completed in 1912, and has been entirely renovated from 1980 to the present, showing 6200 square feet of public plant displays. The oldest plants on display now are probably the Sago Palm (Cycas revoluta) and the Jade Tree (Crassula argentea), both over 75 years old. Molbak’s Garden & Home is a spectacular plant nursery in Woodinville. Let Molbak’s dazzle your senses with orchids, exotic plants, and seasonal plant displays such as a vast spread of Poinsettias around Christmas season. Search for latest Seattle, Washington travel books on Amazon.com.